Michael Kemerer has made his name known in Iowa Wrestling over his first two years of varsity action. Kemerer came right out of the gates as a tough and exciting competitor for Iowa and has not looked back. Michael Kemerer is also in my opinion the recruit that really changed the direction of Iowa Wrestling. Kemerer was a top ten overall recruit in the Class of 2015 and was a product of the Young Guns Wrestling Club in the Pittsburgh area coached by former Iowa All American Jody Strittmatter. 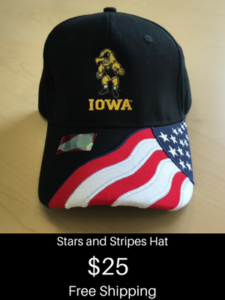 Iowa Wrestling now has three more Young Guns products in Kaleb Young, Spencer Lee, and Max Murin. After placing third as a freshman and fourth as a sophomore at 157, Kemerer is making the move to 174 this year. I have no doubt that Kemerer will be a force at 174 and be a very entertaining wrestler for the Iowa Wrestling fans. The big talk for you over the off-season has been you going up two weight classes. What can you tell us about going up two weight classes this year? Michael Kemerer: It was something that after the season I let myself eat and workout and grow and really did not think about weight or anything for awhile. It got to the point that I was joking around with some people that I was getting pretty big and I may want to do a two weight jump or something. I kind of talked about it for a little bit but I worked on getting better in wrestling. It looked like the best move for me and I would say it was pretty natural. Once I committed to it I just kept doing my normal workouts just on full feed, wrestling hard and lift hard. It was pretty natural in my opinion. With this being your fourth year in the program, how is the program the same or different than when you first came in as a true freshman? Kemerer: I would say it is the same in that the standard has always been to work super hard. Everything is earned obviously in this program. That is the philosophy. I think it is changing a little bit. That is not a knock on the guys that were here when I got here. The type of guys here now are a little bit different. I think it’s a good thing right now. I think we have a lot of good guys that are living the right lifestyle and doing the right things. That is something that has been changing for the better and I think anybody you talk to that has been here for four years would agree with that. What does it mean to you to have the NCAA National Championships in your hometown of Pittsburgh? Kemerer: It’s really cool. The biggest thing is to take it one thing at a time as the season goes on. It’s cool to know that when I get there it’s in an arena that I have been in before as a Pittsburgh sports fan. I went to a Pittsburgh Penguins game there last year and it is a really cool arena. I will have lots of family there. I know it is really cool for them. For me it’s cool too. You were the first Young Guns product to arrive on campus in the Fall of 2015. Now you have been joined by three teammates (Kaleb Young, Spencer Lee, and Max Murin.) What is it like for you to have those teammates that you have know for years and came up through the ranks with back home in Pittsburgh? Kemerer: It is really cool. Kaleb Young committed a couple of weeks before me but I was the first one here. Before he and I committed, there had never been a Young Guns wrestler here. It is neat to see that it has changed and there is a lot more of those guys out here. It is really cool that I have grown up wrestling with them and doing something that we were dreaming about a couple of years ago. So it has been really fun to see. I know you are always warming up getting ready to compete yourself, but who is your favorite teammate to watch compete? Kemerer: Everyone loves to watching Spencer Lee wrestle. That would be the guy that I would say. It’s tough this year because there are so many fun guys to watch. You have Stoll. For a heavyweight I think he is super exciting to watch the way he hand fights. How strong he is out on the mat. Marinelli too. So there are a lot of guys. What are you expecting from the team for performance this season? Kemerer: If we just go out there and wrestle hard and keep getting better every single week, there is no reason why we cannot win nationals at the end of the year. There are a lot of things we have to do first that goes into it and there is a lot of work that goes into it. We have the right frame of mind and we are going to take it one day at a time. What is your entrance song to home dual meets and why? Kemerer: It’s “Who let the dogs out?” The reason is that I really did not know what I going to come out to. I was joking to someone about some people called me Kemdog. I came out to it and now everyone knows it. People ask me if I am going to change my walkout song and I really can’t now because people like it. What advice would you have for young wrestlers or parents that are looking to get to the Division I level. When you do camps, is their one bit of philosophy or advise that you tell the young wrestlers and parents. Kemerer: I would say to make sure they are enjoying the sport when they want to keep getting better. The biggest change that I noticed growing up especially at my club at Young Guns is I remember hitting a certain age where it went from my dad having me do stuff to me wanting to do it. So really getting kids to be driven and to want to get better and work on their own and that independence is huge. It is safe to say that Michael Kemerer carries himself on and off the mat as a winner. He does it all with All-American and All-Big Ten Academic awards, top notch young man, very hard worker in the room, and a real tough competitor on the mat in competition. If Michael Kemerer is indeed the one wrestler that started to turn the Iowa Wrestling program in a different direction for future success, they made a great choice. 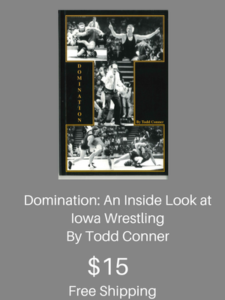 It is because of guys like Michael Kemerer that I am such a big Iowa Wrestling fan. If the next two years are anything like the first two for Michael Kemerer, Iowa Wrestling fans are in for some great entertainment.